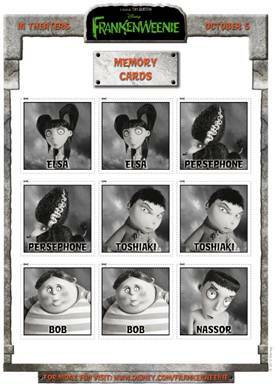 Here’s a Frankenweenie Memory Cards game for you to download and print off for your kids to match up all the characters from the upcoming movie! Thanks! This is great 🙂 Looking forward to October 5th! I have been reading some very promising reviews for this. Can’t wait! This is a fun way to use something that the kids are interested in to develop visual memory skills. Thank You.. will surprise the kids with these for the weekend. oh this is a nice game, but anyway, I really don’t know where to comment that’s why i dropped by here. thanks again for giving me the opporunity to link up my giveaway! more power! I heard this movie is really cute! This game will give the kids a start with memory to match up the characters. Great game, great fun! Thanks for the good idea. This movie looks so cute I cant wait to watch it with the kids and the memory cards my kids would love. Even though my children are adults, I think we will still enjoy watching this one together! Excellent! One more game/activity to add to my box. I am going to send my grandkids some small items for Halloween and was printing off sheets and activities that fit in with the Halloween theme. This will be perfect. Thanks. I love Frankenweenie, and these are adorable! Thanks so much for sharing!